You might think, looking at the open tabs on my browser, that I’ve got death on my mind. And you would be right. My father passed away in December from melanoma. The end was about as peaceful as we could have hoped for, but it was still hard to watch. I spent most of what turned out to be Dad’s last day holding his hand, wondering if this was it. We had all been asking for weeks, out of Dad’s hearing range: How much time does he have? His clinicians mostly said they didn’t know. When one doctor gave a bedside estimate, Dad seemed to think it was a deadline and, when the day passed without incident, he was nonplussed. Modern medicine knows many things, but it does not know one big thing: When death will occur. I described Dad’s state to two close friends who are doctors and they both confirmed that death has continually surprised them over the course of their careers. People live and die unpredictably. My sister joked that she was adding her Google coroner’s license to her Google MD, searching on symptoms as she observed them. So I did the same. That last day, holding Dad’s hand, I tapped out “what does dying look like” with my left thumb and went down the check list curated by the Hospice Patients Alliance: Signs and Symptoms of Approaching Death. Dad met nearly every one. I didn’t feel panic or fear. I felt grace. I had spent days, weeks, months with Dad as his disease progressed. We had said everything we wanted or needed to say to each other. Now he couldn’t talk and he could only see me if I stood next to his bed. So I did. We looked into each others’ eyes and I had the uncanny, déjà vu feeling of looking into my newborn sons’ eyes. Caring for someone in this end-state is very much like caring for someone in the beginning-state. Dad’s eyes searched mine, much like my babies’ eyes searched mine. And I met their gaze with love, reassurance, warmth, and strength. I said with my eyes and, to Dad, with words: I love you. You are safe. You are not alone. I am here. Other people love you, too. We are with you. Preparing for a loved one’s death is incredibly personal, complicated, and difficult. I am grateful to those who share their stories and to those who document the facts. I learned from both along my journey and continue to learn. Here are the articles on my tabs today, by the way, and I urge you to read them. Death is universal. Be ready. 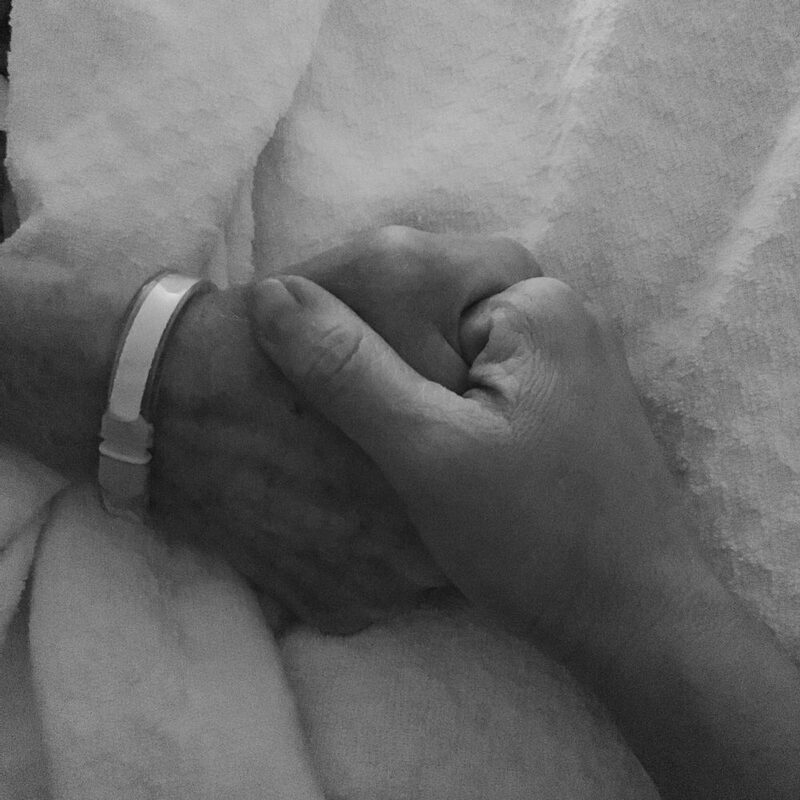 Featured image: Dad and I holding hands on what turned out to be his last day. I lost my dad this December and it still hurts. He was 76 years old and had idiopathic pulmonary fibrosis. He was aware that his lung capacity was getting worse over the last year but he did not need supplemental oxygen. He was still regularly gardening and running errands. Saturday morning I got a call from him that he was planning on going to the ED because he was running a fever. He got up with my mother to drive to the ED but almost fainted and then they called an ambulance. When I got to the ED, an hour away from where I live, he was in a good mood. We joked and he took a picture of us on his phone and I took a picture of him. The supplemental oxygen was helping him. When I drove back that night I only expected him to have to stay a day or two. He was treated with steroids and a broad spectrum of antibiotics for pneumonia. Over the next several days his breathing became more labored and he required even higher levels of oxygen. He was still a very strong man emotionally and physically during this time. When I left him Wednesday morning I knew his condition was not going in the right direction. I held his hand and was able to be there for him. He had talked with pulmonologist about the potential of going on a respirator. My mom visited with him and she wanted to stay the night with him but he strongly refused. Until, about 9 pm he was texting his grandchildren and giving them updates on his condition and his hope that he would go home for Christmas. At midnight his heart stopped and they called a code but were unable to revive him. Each death like each birth is unique and we can plan for it but it unfolds its own way. As someone who creates predictive health care models a model will never capture this level of detailed timing. There is a limit to mathematics and that is where the human spirit lives. Janos, I’m sorry for your loss, the same vintage as my own. My dad was 78 years young and that, I think, adds a twist to grief. Beautiful story Susannah. My father died last year at 92. He was in a hospital bed in one room in the asssited living apartment he lived in with my mom but when she woke up and went in to him with hospice nurse to get him up for the day he was gone. We can only hope he died peacefully in his sleep but we don’t know if he was perhaps awake and in any distress. The hardest thing was not being able to be with him at the end and say goodbye. When I was asked to review the new Kathryn Mannix book for WSJ it made me think again about how much I missed the chance to hold his hand at the end. Hope you are well and doing some exciting new things…would love to reconnect sometime! Thank you, Laura! I’d love to read your review — will find it online or on paper, some way, somehow. As for me, I’ve started keeping a Now page — a fun, monthly answer to “What are you working on, thinking about, reading now?” And yes, let’s reconnect. Being by someone side during the death process … and it is a process … is a profound moment of human love, connection, and despair all mixed in one. I love that even in the end stages of life there remains a beautiful mystery, like a lotus blossom waiting to unfold, and not even the best of science can predict, nor those with a lot of experience with it. Thank you for noting the coming of the full circle of life because it certainly is. And, yes, it can be a beautiful death, closure can happen, and the person who is passing remains in control to the end. “Like a lotus blossom waiting to unfold” – thank you for this, Alex. We are all part of an ecosystem of processes, folding & unfolding, beginning & ending, death and birth being the most profound because they seem to be so decisive. I like to think about how the months leading up to that final day were just as crucial to the process of Dad’s death as that final hour. That being there throughout was just as meaningful as being there at the end. My philosophy on this comes from my study of Jewish wedding traditions which hold that the year of engagement is as much a part of the ceremony as the exchange of rings. Takes the pressure off “the big day”, which I like very much. In the context of caring for someone at the end of life, this means that someone who was there all along but not at “the moment” was still an integral part of the process of dying. I had a virtually identical experience with my mom last May, Susannah, reading the same lists, saying and doing the same things, and marveling as I realized how deeply personal and meaningful those final days and moments are. Thank you so much for sharing this very moving story. And my sincere condolences on your loss. Thank you, Bill. Condolences to you, as well. HI Susannah – My thoughts are with you – each step alone without our dads is a step into a new world. But your story also inspired me — We have shared many conversations about person-generated data and your beautiful post and picture made me wonder where data generated in the course of significant life events when we are involved but not the identified patient. Our courses of grief, love, accomplishments and disappointments all contribute to our health and well-being (or lack there of) – yet we have at best very impoverished ways to record and note those events. Patti, that is a profound question and I’m going to spend some time thinking about it. Where indeed is the data held that was part of my (and my siblings’ and mom’s) calculation of Dad’s (and our own) health and well-being? It reminds me of another question I’ve been working on recently — how to conduct an impact review, to go along with a financial review at the end of a year. How do you measure if something you did was useful — and, if you have the opportunity, should you do it again? More on that in another upcoming post. I’d love to hear other people’s thoughts about what Patti wrote. My father died of old age, shortly after his 95th birthday. They were treating symptoms but there was no disease as such. His body was just breaking down. He was a firm believer in hospice care and at the end was in inpatient hospice for 3 days. He was alert but feeble and just occasionally could be fed sorbet. By the last day he had stopped talking and just seemed to lie quietly in bed. The staff was checking him every couple of hours. In the afternoon the doctor came in and couldn’t find a pulse. We were there – he just slipped away silently. It was a good way to go. He knew he was going to die – obviously, since he was in hospice – but didn’t talk about dying. I think he was glad to have the physical burdens taken away. He found it difficult to walk, for example, but had a good quality of life until the last month or so. Deb, thanks so much for sharing that story. Sorbet! I love that detail. What flavor did he like? Once again your generosity shines through. Thank you for the post and (as always) the informative, empowering links. My dad passed a few days after my final visit, back when I lived a thousand miles away. My own sense of a death comes from my anticipation of my own, 11 years ago, when that’s what seemed likely. I asked my PCP what it would be like, and he answered about “We’ll keep you comfortable.” I said “No, that’s not what I mean. I mean, what will happen? Will my lungs fail, so I’ll be short of breath?” etc. These signs would have been invaluable. As I think you know, I found myself at peace more than I’d expect because around 1990 I’d heard recordings of Ram Dass talks on Conscious Aging and on Approaching Death. He’s been with thousands of people through the final process. And it super-amazed me that when he and Timothy Leary had used LSD and written down the 7 levels of consciousness they discovered there, it later mapped precisely (he says) onto the 7 worlds of the afterlife described in the Tibetan Book of the Dead. What’s THAT about?? I’ll absorb your links. Thank you for everything you are, the model you provide, and the information you share with us. Some people are ready to know the physical details – the signs – and I think we should not shy away from allowing people to know them. You and I have talked about how the patient empowerment movement runs parallel to other liberation movements, including feminism, and I see the unveiling of death to be parallel to the unveiling of birth. Just as women have taught each other the awesome, sometimes alarming details of birth we have a right to know the awesome, sometimes alarming details of death. And yes, I need to follow up on the Ram Dass insights! I’m ready. I think. I’m nearly finished reading Life 3.0, a disturbing book about A.I. recommended by “medical futurist” @Berci. You know I love tech stuff, so AI per se isn’t what’s disturbing. What’s disturbing is that when you really get to the edge of the known universe (of knowledge) and look beyond, it’s increasingly hard to draw a line between consciousness and biology: evidently whatever consciousness is (never mind “just” intelligence), it’s independent of the “machine” it runs on. What wavelength is that cat tuned in to? That surely won’t be matched by today’s computers looking at EMR data. Re “Not the death we were promised”: UGH. Cautionary tale. > keep profit margins up. Increasingly I see this as the great Satan, robbing families (not to mention people in need) of WHAT they need, to keep profit margins up. The recent case of a Baltimore hospital “dumping” a sick woman at the curb is another specimen – the US health system has plenty of aggregate money, but most all of the individual entities in it are “under pressure to keep profits up.” So each of them, and effectively the aggregate, dumps her on the curb, to keep profit margins up. Commenters on my FB post about this say this isn’t at all rare and it’s been going on for years. How might we change regulation, monitoring, and enforcement such that people licensed to truly provide care must actually do so? How might we? In the absence of a government we can depend on for this, perhaps we should have Yelp or Tripadvisor reviews. Certainly that one should be outed. Without it, the executives who are responsible first to their boards have no reason to provide actual care instead. I’m glad you were able to be there and do everything needed and possible. I haven’t finished reading it yet, but it’s worth everyone’s time to take a look. Just thank you, Susannah. Thank you. I bow in your general direction, my friend. Your amazing. Your post will help countless others :). Beautiful post, Susannah, thank you for it. Thoroughly enjoyed your comment. Obviously right from the heart. I had the pleasure of seeing him at the Medical Center just prior to his moving to another location. Sick as he may have been he portrayed none of it. He just had that great big smile seeing me and so we had some very enjoyable moments together. Memories were still with him. I always enjoyed his company. Thank you, Harry! Dad did have that great big smile, right up to the end. Thank you for this post, Susannah. I found it comforting. My dear mom died this past weekend. And, though Mom was 93 and had a wonderful life, it is still hard to say goodbye to your mom or your dad. Jan, I’m so sorry for your loss. 93! That’s awesome. But still, any loss hurts, no matter what the age. May her memory be a blessing. Like I’ve said, you live with such awareness and such intentionality. I admire you so.